Twitter announced Monday that users can now edit photos with filters inside its own app, flipping the bird to one Facebook-owned entity. The site is updating its app for iPhone and Android to "introduce a few new ways to enhance the images you tweet." Google Play is seeing the new filters, while the App Store started showing the scopes Tuesday. The news comes just hours after Instagram cut itself off from the tweet-verse. Instagram announced last week that it would remove support for Twitter Cards and followed that up by dismantling photo integration. Now, only links to Instagram photos will work in Twitter. The panic of not being able to upload artificially aged snapshots should be short lived with the updates. 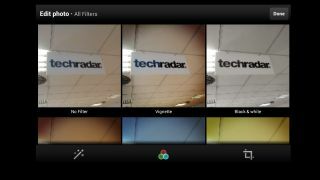 Twitter is introducing eight filters, ranging from black and white to vintage. Cropping and pinch to zoom are part of the editing package. The updates also bring a bird's-eye view element that lets users see how each filter will affect their photos in a single grid view. Photogs can swipe through to compare options. The final edit tool is a wand that, when tapped, implements an auto-enhance function to balance light and colors. Instagram also released an update for its iOS camera Monday, adding a preview feature that pulls up the camera roll's most recent pic, an optical grid guide for lining up live photos (plus a permanent grid guide to scale and crop) and speed enhancements. The iPhone 5 camera got its own improved camera roll image selector, too, while Instagram boosted its tilt-shift feature to give your pic the same "blur" visible in the preview screen. Instagram's programers also added Foursquare integration so that when users touch a button, they enter the Foursquare app (or mobile website) and receive instant venue info. Not to be left out, the photo site feted its Android camera with a new filter (don't worry, iOS gets it too). "Willow" is optimized for portrait taking with its monochrome filter touched by purple tones and a halo of translucent white, Instagram said. Twitter, though only just starting on the photo filter path, likely has many more features to come, while Instagram, the king of social network snapping, won't relinquish its thrown without a fight.